Like many other longarm quilters, I use doodle cloths to practice new-to-me quilting designs. I load muslin as a the top, whatever batting I have on hand (frequently splicing small pieces together) and using something sturdy as the backing. Sheets and home dec fabric are my favorites. I've taken some hands-on longarm quilting classes that have resulted in we students taking home the sample doodle cloths we stitching in class. I've even cheated with doodle cloths! When I've filled up the muslin top fabric, still want to practice some more but don't want to go through the nosebleed of loading up another sandwich .... I've actually just thrown another piece of muslin right ON TOP of the already stitched doodle cloth! Sure, I'm stitching through 4 layers .. but who cares? I'm just practicing the stitches and all I really need to see is what's on top! Sometimes, I keep the doodle cloth samples. 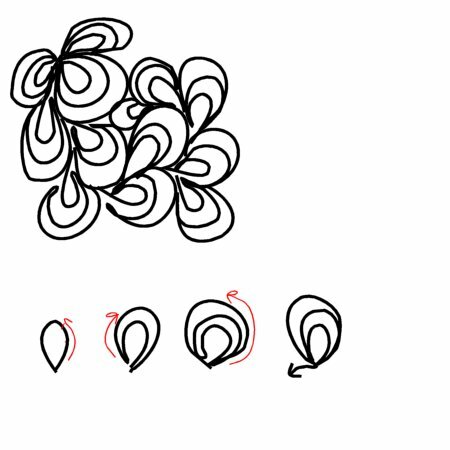 They show examples of designs that I know I would like to use "sometime" and need to keep the stitched sample around to remind me. But, I must say, MOST of the time, once I've done the doodle cloth .... and then probably used the design in a quilt ... I don't NEED the doodle cloth any more. What do you DO with them? They certainly can't be used for quilts! For one thing, since I'm using a regular width of muslin, it's just not wide enough. BUT .. it occurred to me that they would be great for pets to lay on. Specifically, the cats at our vet. When cats are kept for observation or overnight or boarded, they are kept in pet cages. The vet & staff do put towels down so soften (somewhat) the floor of the cages, but it can't be terribly comfortable. 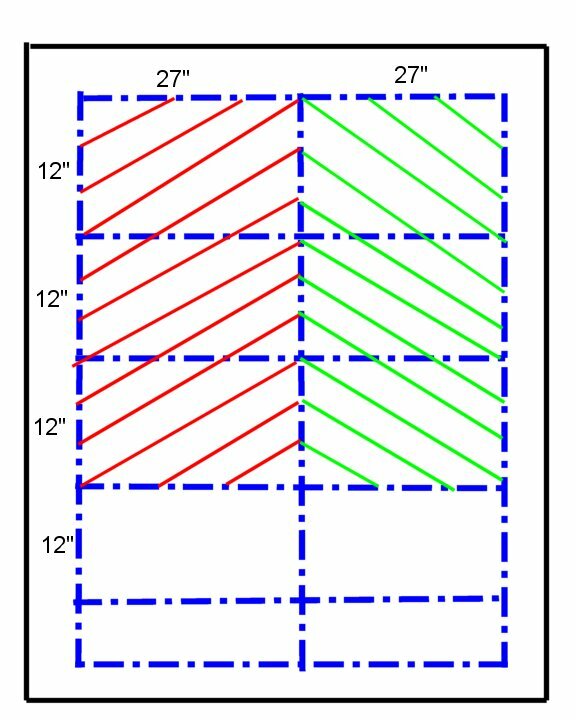 I asked our vet the dimensions of the cages ... 27"x36". Using that as a basis, I use 60" wide muslin as the top, and draw (with a Sharpie) two 27"x12" rectangles (landscape mode) on the muslin. My longarm is a Tin Lizzie 18". The useable workspace is about 16", so a 12" deep rectangle fits quite nicely on the workspace. A 27"x12" rectangle is a nice size to doodle in. If I need more space to doodle, I just wander on over to the adjacent 27"x12" rectangle. 54"x12" is MORE than enough to doodle in! 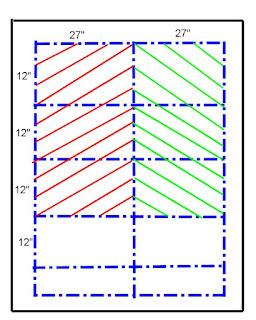 I make sure that the 60" wide muslin is at least 1-1/4 long ... that let's me draw (3) sets of the 12" deep rectangles. When I'm done doodling the rectangles, I have (2) sets of 27"x 36" rectangles! I cut those sets out, bind them with leftover bias binding ... just like I do for my quilts. These are *sturdy* pads for the pets to lay on ...and for the vet to launder! I'm very pleased that my vet appreciates them! So, this last batch yielded 7 sets of cage liners ... and one oddball one! I had some leftover half-hexies from a project. I sewed them together, added on some plain border to size the top properly, sewed some home dec samples together for the backing and ... voila .. one more cage liner! What is this quilting design called? All righty then, Quilting Public ... I'm doing an all-over fill that *I* have called 'nested clamshells' but a Google search with that term results in a big goose egg. 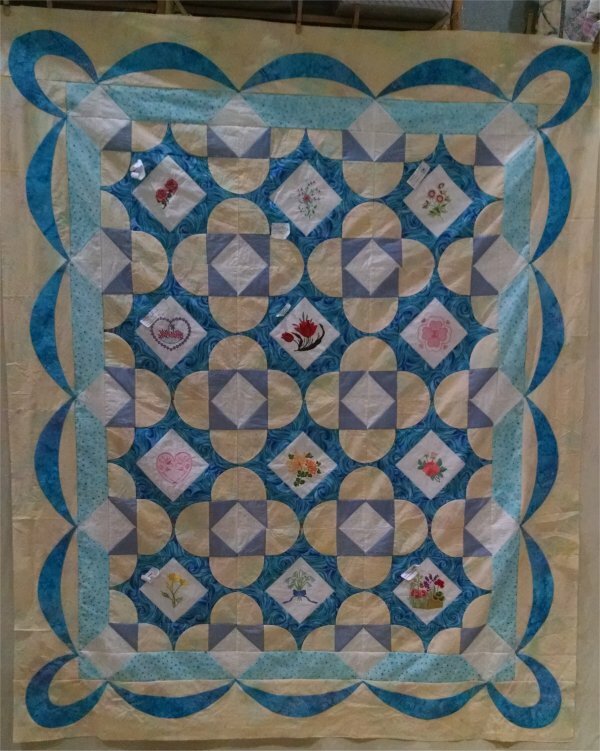 I've gotten suggestions from other quilting friends of "Endless Tears" and "peacock feathers". In this picture, I've drawn the overall fill and below that, the progression of how to create it. I recently posted about a 21 year old UFO that I finally assembled into a top. Well, this is another long term UFO, although not 21 years. :-) From one of the ladies who participated, the timeframe of 2005-2006 was suggested and I have no reason to disbelieve it. During that time, I was an active member of About.com's Quilting forum. Wowsers, that was a hugely active forum! When I first joined, I participated in lots of swaps .. until I realized that those swaps were simply generating a LOT of UFOs on my part. But while I was active, one such swap was between those of us who had embroidery machines. We decided that we would swap both 4"x4" designs, as well as 5"x7" designs, for those of us who had 5"x7" hoops. 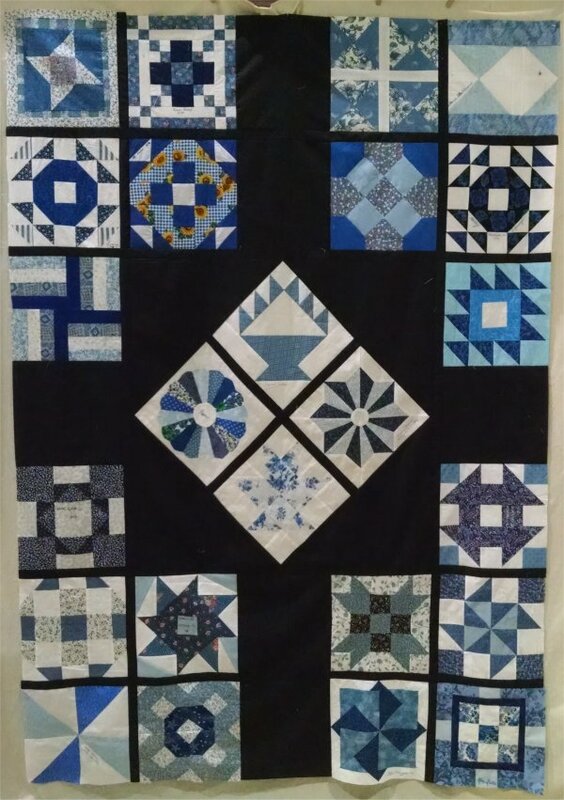 I admired all the blocks as they came in but didn't even think of a layout. When I pulled the baggie with the blocks out to work on them, the first thing I needed to do was to *figure out a layout*. I tend to dislike straight up "grid" layouts. Certainly there are times when that is the best option, but I like to try to think of something different. So, for the 4x4 blocks, the design would be a diamond in a square. I looked in many of my reference books for ideas on how to create an interesting layout with them and came across some cutting template rulers that I had purchased *long ago* but had never used. This was an excellent opportunity to do so! The templates are "Creative Curve Rulers" by Virginia A Walton. I also purchased her companion book. Essentially, these templates make cutting and sewing Drunkard's Path blocks very easy. And that is what I used ... a pair of Drunkard Path blocks, side by side, to frame the diamond in a square embroidery block. Half square triangles filled out the corners. To make the top into a useable size, I put on two borders ... the first inner border contained an extended half square triangle, so it made a diamond. The final, outer border had machine appliqued swags. I used a buttonhole/blanket stitch to sew the applique to the border. I'm very, very pleased with the outcome, especially since I was able to make the entire top with fabric that I already had in my stash. I'm now on a Quest to contact the ladies who made these blocks, not only to thank them for their lovely work, but to show them that the blocks really HAVE BEEN made into a top! Jeri Mihm of Borger, TX contact made! woo hoo! Irene Puzinas - contact made! woo hoo! Anna Topolski - contact made! woo hoo! This post is going out all over blogland, in the hope that some of the ladies listed might see it and remember our quilting friendship on FIDOnet of long ago. It was back in 1995, that I (and the ladies listed here) were part of a FIDOnet BBS system. We were quilters and we participated in swaps and lottos and messages back and forth. This was WAAAAY before the internet as we know it today even existed. There was no such thing as posting a message and getting a practically instant response. Messages that you posted to the BBS system had to be passed along to the member systems, where replies to your original post would be entered and *eventually* you'd see the replies show up on the BBS system that was your "home base". But, it was a wonder! I connected with lots and lots of quilters, most of whom I had no idea where they lived. Through the swaps that we did, we obviously needed to share home addresses and it was then that we all realized the international flavor of our quilting forum. In June 1995, I happened to win that month's lotto. When I received all the blocks I was due, I figured out a layout for them .. but that was as far as I got. I am really, *really*, REALLY great at procrastination and this one was a doozy. The layout is certainly non-traditional. I had two blocks that definitely needed to be presented on-point. I picked two other blocks that didn't have an orientation, so that it didn't matter which end was "up". Those four blocks became the center "diamond" medallion. I just plopped the rest of the blocks around the medallion, spacing them so that it looked pleasing. 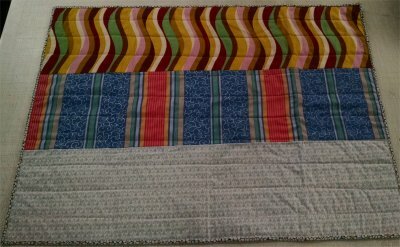 The resultant layout certainly gives me a bit of negative space to do some interesting quilting, when that time comes. Let's fast forward to November 2016. I had pulled this long-ago UFO from my bin of UFOs and *finally* assembled all the blocks! Yeah, it only took me 21 years. :-) BUT, it got done and I feel very pleased with myself on this accomplishment. 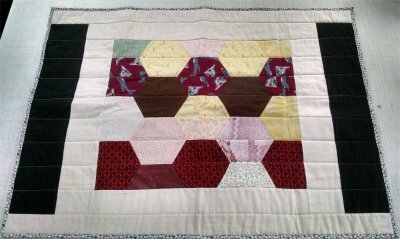 This pieced top has now been put in the ever-growing Pile of Tops to be Quilted. My focus *now*, as it has been for the past year or so, is to work on my UFO bins ... to get those assembled fabrics into a pieced top, ready to be quilted. The actual quilting will come at a later date .. but right now, I feel absolutely compelled to empty those bins by actually making the tops. The ladies who participated in this lotto are listed below. I would just LOVE it if any .. or most! .. of them would contact me. (Leave me a comment below or I'm on Facebook, too) :-) Because I failed to retain the envelopes the blocks came in, the only information I have is what was signed on the blocks, which means in many cases, it's only a name. *Sometimes* I have a location .. and that location is only correct as of 1995. It certainly may have changed in the intervening 21 years. Susan Bewick - contact made! woo hoo! Tricia (Pat) Knox - contact made! woo hoo! Kay Mainguth - contact made! woo hoo! Julia Sidebottom - contact made! woo hoo! Andrea Suais - contact made! woo hoo!